THE FLYING ANTS are back. People all over the country have been taking to Twitter to capture the ant activity in their area. This comes as the ants take to the sky for their annual mating season – known as the nuptial flight. There is a common belief that all ants begin sprouting wings on the same day annually, or in the same week. But this is not the case – the so-called “flying ant day” can be spread over a number of weeks at the height of the Irish summer. The hashtag #FlyingAntDay has been cropping up regularly in the last few days – with people posted pictures and videos the winged insects from Cork, Dublin and elsewhere. Plague of #flyingants in County Down! “Every day in July is a flying ant day in my opinion,” Brendan Ryan, director of the Irish Pest Control Association told TheJournal.ie. 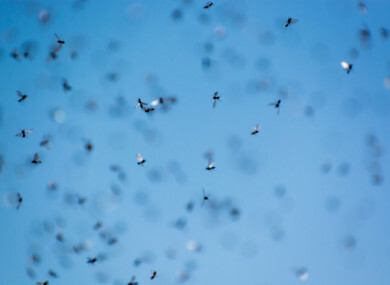 This is because July is the peak time for seeing flying or winged ants taking part in their nuptial flight, Ryan explained - as reproducing females, known as queens, go out to seek mates in order to form a colony. Both the males and the females sprout wings and swarm together as part of this process. The nuptial flight season is either accelerated or decelerated by the weather. Warm and humid conditions result in a surge in nuptial flight activity. The recent heatwave weather will definitely have accelerated the mating season, said Ryan. The ants began swarming as early as June this year. Ryan added that the season may go on until August as the swarms can begin any time at random during the season. Are these normal, everyday ants? Yes. The nuptial flight is a natural part of the life cycle of the common garden ant – the harmless creepy-crawly we are all used to seeing. Ryan explained that a single swarm is usually made up of ants from several neighbouring colonies. The female ant loses her wings after mating and she then goes in search for a place to burrow before she lay her eggs. The male ants die a short time after mating, while the female continues on in the process of starting a new colony. Queens can live for 10 years or more while males only live for a few weeks. How do I keep them out of my house? Ryan recommends common sense housekeeping as the best way to prevent infestation of winged ants. The insects, he said, are attracted to sweet foods and drinks – so cleaning up after spillages of fizzy drinks or food preparation are key steps. Keep bins clean and tidy too. Although some people will try to cover or seal cracks or crevices in their homes, Ryan said that as ants are small and agile, they will find a way in if something is there to attract them. People can use commercially available chemical sprays too (always follow the directions). If you can’t make it to the shops there are a number of DIY techniques too – the most common being water combined with either washing-up liquid or lemon juice in a spray bottle. People can also seek the services of a professional pest control company to fumigate the house in the event of a large-scale infestation. “Prevention is better than cure,” Ryan said – stressing that the only way to avoid the ants altogether would be to fumigate at the crawling stage, when the first ant activity of the year happens, between February and June. Email “So the flying ants are back - and the heatwave means there'll be a longer season this summer ”. Feedback on “So the flying ants are back - and the heatwave means there'll be a longer season this summer ”.